The Standard PF-P3200 Desktop Paper Folder is a fast, convenient paper folder that barely takes up any space so can fit almost any surface. With six standard fold patterns that are available this is one of the best machines on the market today. Setup and operation is simple and does not require advanced operator skills for setup. Each section is automatically set by selecting sheet size and fold pattern using the operation panel. The PF-P3200 has a folding capacity of 240 sheets per minute, and can hold up to 550 sheets of paper at time for constant feeding. Additional special sheet sizes and fold patters can be set using the ten keys in the extension panel, and 8 jobs can be memorized for instant recall. The PF-P3200 neatly stacks folded sheets on the delivery conveyor for easy job handling. The user has the option to choose between four different modes for comfortable operation. Silent Mode is a top level sound deadening design that ensures quiet operation and does not disturb others in the area, and the sound pressure is reduced up to 70% compared to the high-speed mode. The Standard Mode has a unique drive control system which is used for quieter operation at higher production speeds (140 sheets per minute). The High-Speed Mode takes a wide range of sheet and fold patterns to be folded at higher production speeds (175 per minute). The Ultrahigh-Speed Mode has a maximum folding speed of 240 sheets per minutes and it is also suitable to fold thicker sheets. 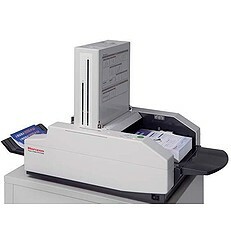 There is a paper jam detection system, and operation procedures are specified on the liquid crystal display. Cleaning or replacement of the folding rollers is a quick and easy task, without any special tools. The PF-P3200 paper folder has pre-programmed 4 paper sizes and 6 folds: letter, half, z-fold, double parallel, gate and engineering. If you have any questions or are interested in purchasing the Standard PF-P3200 Desktop Paper Folder, visit us at SpiralBinding.com. We have great pricing on a full line of Friction Feed Paper Folders. Call us at 1-800-631-3572 for more information!